I tried to cover the stuff that operators, programmers and machinists want to know. Topics include: why do you need 5-axis and what are the benefits of it, explain the different machine configurations and the pros and cons of each, rotation directions and the “right hand rule”, 5-axis vs. 5-sided, purchasing considerations, 5-axis terminology, workholding, tooling, maintenance considerations, 5-axis NC programming and post processor configuration, tool vectors, machine accuracy, and programming transform planes. The inspiration for this book came while I was preparing for a seminar that I was asked to present at the Modern Machine Shop’s Top Shops Conference here in Indianapolis earlier this week. While researching to see if there was any latest-and-greatest 5-axis stuff that I needed to learn about, I quickly realized that there just isn’t much out there for us...the machinists. 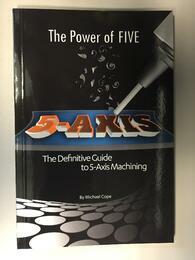 I found plenty of whitepapers geared toward engineering minds, and some books and information about CAD/CAM toolpaths, but nothing that explained 5-axis machining from a shop floor perspective. So…I decided to take a shot at filling the void! If you would like to learn more about this book, or if you would like to purchase a copy, please click the link below. …and, if you do purchase one of my books please comment and let me know what you think about it. I always like to hear feedback and receive questions from my readers.